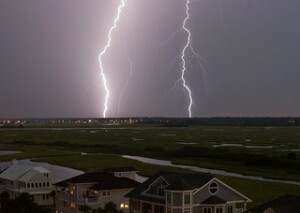 Soccer players and fishermen are more likely to get hit by lightning than golfers. Saturday is the worst day of the week for lightning fatalities. July is by far the deadliest month for lightning deaths. Forecast is calling for thunderstorms this Saturday. I'll alert the Men's Soccer team at once! These numbers look statistically signifcant, but they are not. Someone gets killed in Ohio by lightning every other year. In order to get something significant out of those numbers, you would have to go back a long way--and then you would lose the characteristics of the culture. Note that there is no mention of swimming. The YMCA now closes INDOOR pools on account of lightning, EVEN THOUGH no one has ever been killed in an indoor pool from lightning. In fact, the pool is probably the safest place to be. So, I better go and cancel my soccer game next Saturday. The forecast says it's going to rain. Golfers should get hit more often than soccer players sice they areb holding their own lightning rod and goofy look clothing (if I am a lightning, I would hit these guys first too). However, golf courses have storm alerts to evacuate the field even during a light summer rain. Soccer players don't stop the game due to rain. Lightning hits more on Saturday because we are more likely to be outside, not working or watching NFL... a seven day work week should solve the problem.